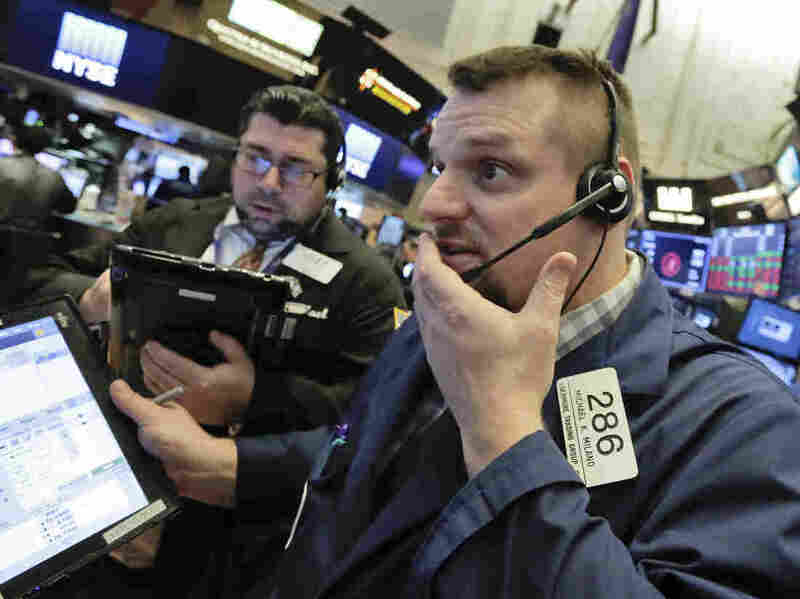 Another Rout In The Stock Market, As Dow Drops More Than 1,000 Points : The Two-Way Wall Street's roller coaster continued Thursday, with all the major stock indexes posting drops of about 4 percent amid inflation concerns. The market has now tumbled 10 percent from its recent peak. U.S. stock markets fell sharply Thursday, with the Dow Jones industrial average tumbling 1,033 points, or 4 percent, to 23,860. Other major stock indexes also dropped Thursday. The S&P 500 fell 101 points, or 3.8 percent, and the Nasdaq index fell 275 points, or 3.9 percent. With the latest drops, both the Dow and the broader S&P 500 are down more than 10 percent from their peaks on Jan. 26, which constitutes a market correction. The market is still trying to find its footing after Monday's huge meltdown, when the Dow fell 1,175 points — a one-day record. Wall Street has been on a roller coaster ride. On Tuesday, the market regained close to half of its deep Monday loss, but on Wednesday the market ended down again. At Thursday's opening bell, it bounced from positive to negative, then headed down sharply. Trader Michael Milano (right) on the floor of the New York Stock Exchange on Thursday, a day when all the major U.S. stock indexes saw sharp drops. The "sell-off has now corrected prices back to the level that preceded the passage of the tax bill" in December, said David Kotok, chairman of Cumberland Advisors. Enthusiasm about a corporate tax cut had helped drive the stock market to record levels. Several factors are contributing to the return of neck-wrenching volatility this week after years of absence in the market. In fact, investors had devised very profitable investment products that allowed them to bet that volatility would remain low. Those bets against market volatility blew up on Monday. As investors in those products ran for the exits and starting selling stocks to cover their bets, they triggered a cascade of automated selling. Kotok says it's not clear but the sell-off of those positions may still be fueling the current market downdraft. Worries about future inflation and rising interest rates also weighed on the market again Thursday. Investors are concerned that growing budget deficits caused by the big tax cut and the pending congressional budget deal are pushing rates up. The Congressional Budget Office says the two-year budget deal will add $320 billion of spending. Investors worry stimulus from the tax cuts and the added government spending will overheat an already strong economy, pushing up wages and prices and sparking inflation. That would create a negative environment for stocks.